OK, let me try to keep this list short and obtainable. I thought I could do my 2012 Knitting Resolutions of making a pair of sock a month, but it wasn’t in me. I guess I am just not destined to be one of those amazing sock knitters that can get beautiful pairs done in the blink of an eye. I did manage to make 6 pairs of socks last year: a striped alpaca one for myself in January, EZ’s mocassin socks out of Malabrigo for my husband in February, 2-at-a-time pink cabled socks that I gifted to my niece but fit her baby brother instead in March, a toe-up sock for my dad that turned out to be too big in April, a quick pair for the dog to keep him from scratching the car in May, and then the lovely pair with self-striping yarn for myself in November. So obviously I lost interest early in the year. That pair for my dad is the one which I just kept dragging to finish, it wasn’t off my needles until September! Again, knitting deadlines and I don’t mix. Complete The Knitting Guild Association Level 1 Master Knitting Program – if I accomplish only this and nothing else in 2013 I will be happy. This is a huge deal for me and it does have a deadline which I cannot put off. Maintain this blog – I did slack off a bit after the holidays, it’s funny how a few days of vacation can completely derail my routine. But I am back now and have every intention of keeping it up, even if I only post once a week. Attempt a new technique – currently I am working on a sleeve for my laptop which I am going to try and felt. So maybe its cheating a bit to list something that I already have in the works, but I don’t care. I am also wanting to bite the bullet and try to steeking, that will be a real challenge. Design my own pattern – Even if its just a simple dishcloth, I need to give this a try and I want this to work. I really, really do. Finish a hibernating project – I specifically have two projects in mind that have been dormant in my craft closet for over two years! One is a tunic that I started in September 2010 and all that is left to do are the sleeves. I want to be able to wear it this fall if not sooner. The other project isn’t as dated, but I casted on in November 2011, it’s a lace shawl and I got stuck on the pattern after completing the first chart. No matter how hard I tried the stitches of the second chart didn’t not line up, I got frustrated and put it aside. These two are long overdue for completion. If I don’t finish them this year, I will wear the tunic as a vest and the frog the shawl. Read my knitting books – My library has so many great books that I have acquired because of the beautiful patterns in them, and yet I ignore all the great knowledge within them! I have to start educating myself further on all things fibers. My knitting knowledge cannot just be compiled of experimentation. Knitting is an ancient craft, if I do some research to obtain the proper skills I won’t be guessing myself every time. 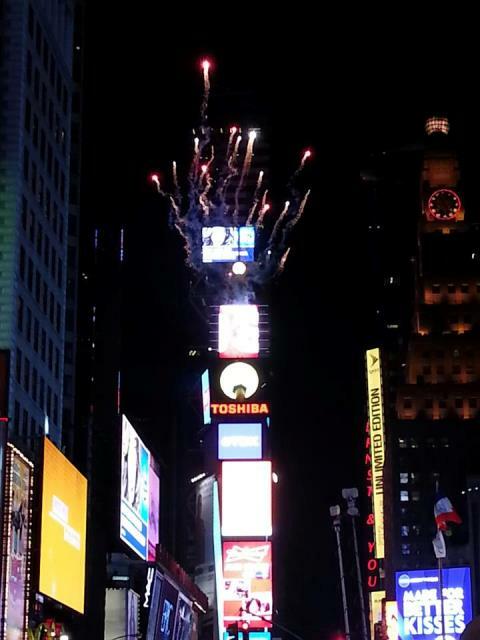 So I told you about my quiet Xmas, but New Year’s was a complete different story; it was very crowded and noisy … we went to Times Square!! Since we were in NYC for my friend’s wedding anyways we thought this would be our once in a lifetime chance to attend this huge event and I am so glad we did! 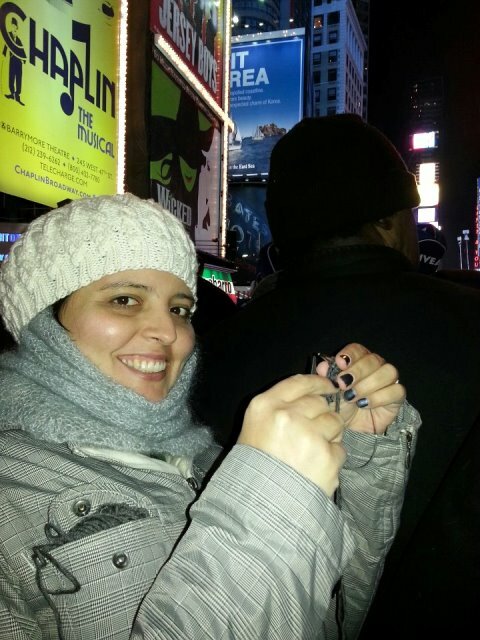 Also, I can’t go anywhere without some knitting and I can’t be expected to stand around for hours and hours without working a few stitches, so there I was, in the middle of Times Square, knitting to pass the time. Though I tried knitting with my gloves, it didn’t last for long, but I was able to make about a foot long i-cord. I am hopeful that 2013 will bring many new knitting opportunities for me and for you as well. Happy Knitting!! It makes me feel like I have my own little LYS. Now I just need about 5 more of these and then I can house all of my yarn! Happy New Year everyone!! 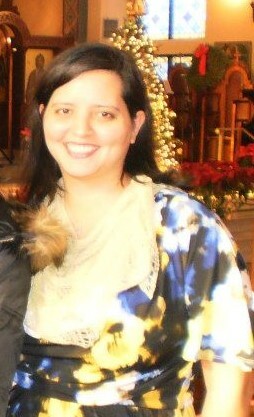 I hope you’ve had a fantastic holiday season and that the new year has started out in a positive way for you. Personally, I had a quite Xmas and an exciting New Year’s Eve, which is just how I like the end of the year to be. That’s just me living up to my blogging name, I am terrible with knitting deadlines! 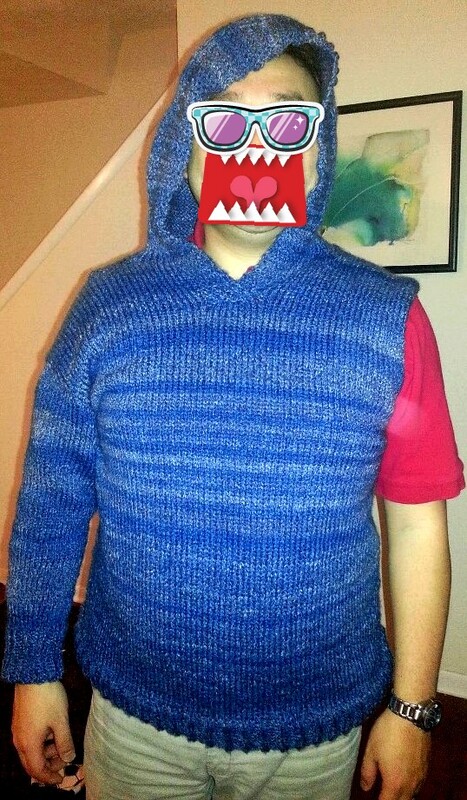 But I did finish it in time for New Year’s Eve, I got that second sleeve done really nicely… except for the cuff. In my excitement to cast-off I did the cuff in a 1×1 ribbing, instead of the 2×1 rib pattern used at the hem and first sleeve. That’s also typical of me, I get so excited to finish off a project that I make stupid mistakes. Thankfully its an easy fix and my husband has a good sense of humor. His gifts to me were knitting related, the man knows what I like. He got me a little jar that has a little needle-yielding ninja saying “don’t mess with the yarn fund” and a button that says “Working on my PhD (Projects Half Done) in Knitting”. There is also the shoe rack converted to yarn storage, he made it sturdy and cleaned it up nicely for me to be able to store my yarn. I just haven’t gotten to that yet because I am unsure how I want to lay out the yarns in there; part of me wants to put only sock yarn in there, or maybe yarns for which I have projects queued on Ravelry, or just stuff whatever fits! When I come up with the best way to utilize that shelf I’ll be sure to share it. The other project that I was rushing to finish was the beaded lace shawl to wear to my friend’s wedding on December 30th. I finished on the 28th and was all ready to block it open on the 29th when disaster struck – the yarn snagged in 3 different rows! I could have cried, but chose to curse instead! 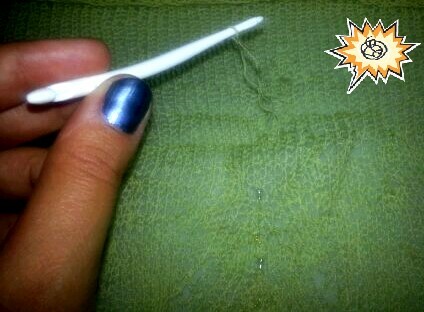 After I got over my horror I spent all morning on the 29th with my crochet hook trying my best to pull the stitches back in place in a manner that matched my gauge. Once I completed that, I blocked it and stood over it with a hair dryer to make sure it would be ready for the wedding the next day, and it was! 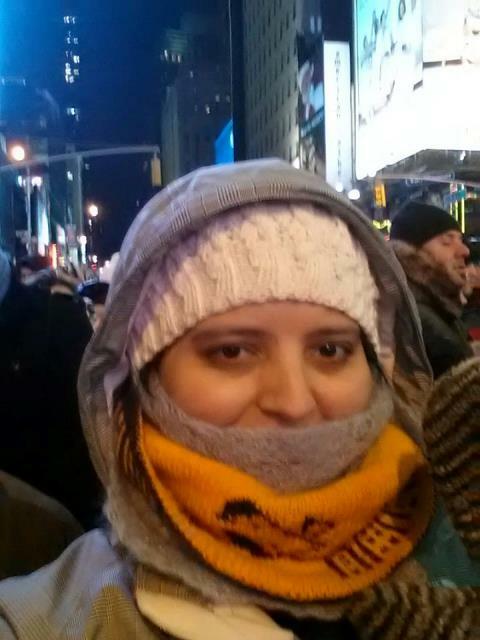 I know that’s not the best photo to showcase the shawl (I snatched it from my friend’s FB page) I’ll get a close up of it with my camera another time. I swear that getting these two projects done in time for major events has left me burned out. We are a week into 2013 and I have hardly knitted anything this year. I need to get my knitting mojo back on track and soon!